The cherry blossom festival in Japan, typically witnessed around late March or early April, marks the onset of spring and paints the landscape in exquisite tones. Plan your Japan vacation to coincide with this festival for a truly unique experience. This is the time when cherry blossoms – called “sakura” in Japanese – make for a charming sight with their fleeting presence in various parts of the country. White or pale pink, sometimes dark pink or yellow, and sometimes changing color as the blooming period progresses, they symbolize the delicate and ephemeral nature of life and attract locals and tourists alike. It’s no wonder then that there’s a word called “hanami” in the Japanese lexicon. It refers to “cherry blossom viewing” or the centuries-old practice of enjoying a picnic or party under a cherry tree in bloom. In some places, you can even enjoy a late-night hanami picnic with pretty paper lanterns to heighten the ambiance. While the blooming period can last up to 14 days, there are some varieties that are in peak bloom for just a couple of days. 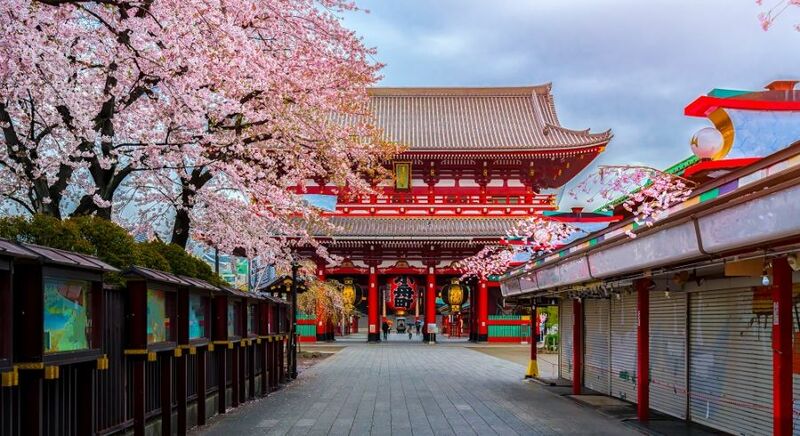 Japan has a special connect with the cherry blossom, to the extent that some would even call it the country’s national flower. It is home to over a hundred varieties of cherry trees, including wild varieties and cultivated ones. The trees are also differentiated in terms of the number of petals, the color of the petals, the shape of the tree, the color of the leaves, and whether the leaves arrive along with the blossoms or after the blooming period. Trees with blossoms of more than five petals are called yaezakura. Weeping cherry trees – the ones with drooping branches – are called shidarezakura. The Somei Yoshino with five-petal blossoms of white or pale pink color is among the most commonly found cherry trees in Japan. The Ukon variety is known for its pale yellow blossoms. While the blooming period can last up to 14 days, there are some varieties that are in peak bloom for just a couple of days. A great way to enjoy the beauty of the cherry blossom in Japan is to observe how it keeps changing as the days pass by. The arrival of cherry blossoms in Japan varies slightly each year depending on weather conditions. 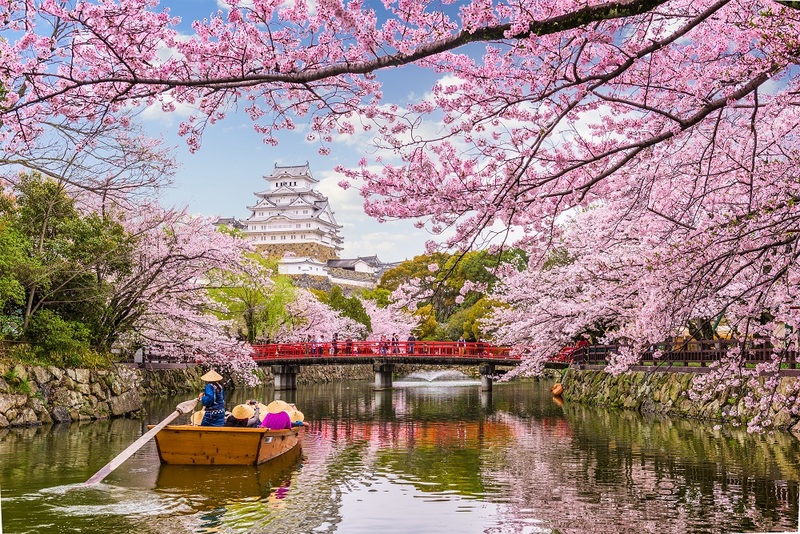 As per some forecasts made in February this year, the cherry blossom season in 2019 is expected to arrive earlier than usual. Aided by a warmer climate, the flowers are estimated to bloom on March 20 in Tokyo and on March 23 in Kyoto. However, accurate estimates of cherry blossom dates are available only by early March. 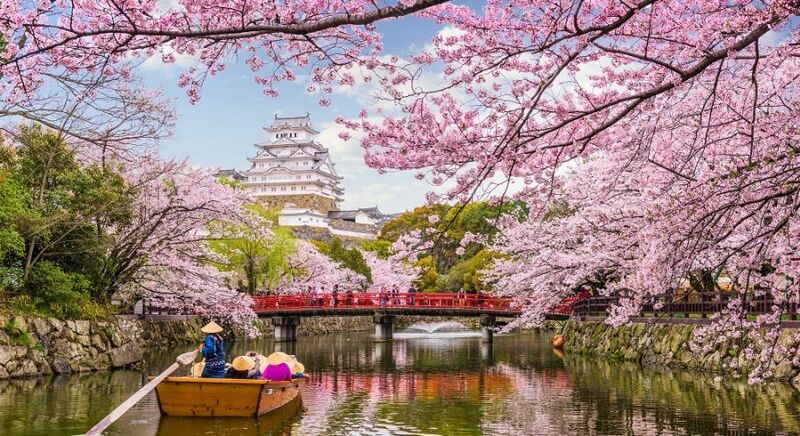 If you’re wondering where to see cherry blossoms in Japan, read on. We’ve prepared a guide to the best places to see cherry blossoms in Japan. 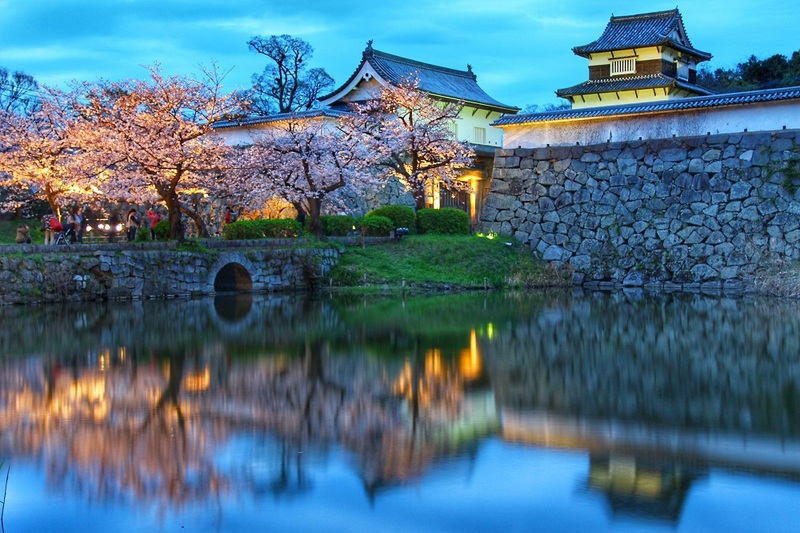 And to make things easier, we have also included our favorite hotels in each city that you can visit for your cherry blossom tour. 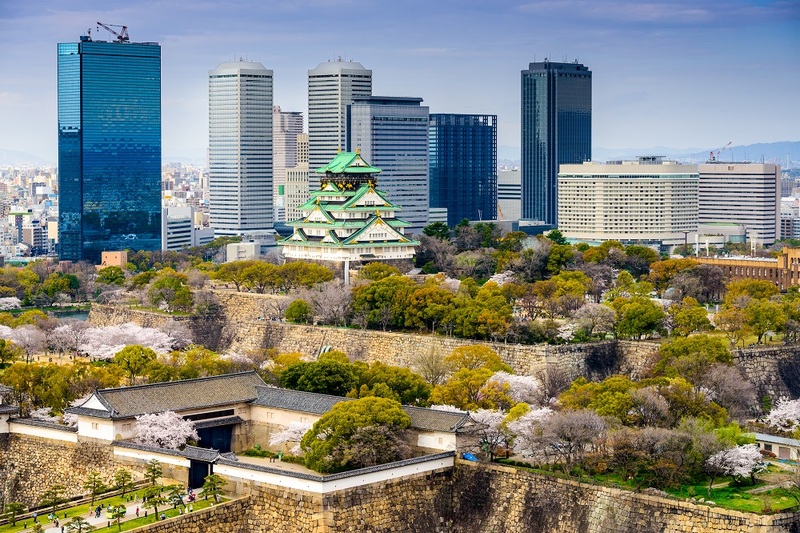 With its urban, edgy vibe and manga and anime culture, Tokyo is one of the top cities to view cherry blossoms in Japan. The best hanami spots here include Shinjuku Gyoen, Ueno Park and Chidorigafuchi. While Chidorigafuchi doesn’t allow for picnics, you can always rent a boat and go around the moat of Edo Castle to view the blossoms; this place also looks great at night when the trees are lit up with lanterns. While in Tokyo, you could stay at the Mandarin Oriental, a luxurious hotel set inside the Nihonbashi Mitsui Tower. You could also consider the Imperial Hotel which is at walking distance from the city’s famous Imperial Palace. 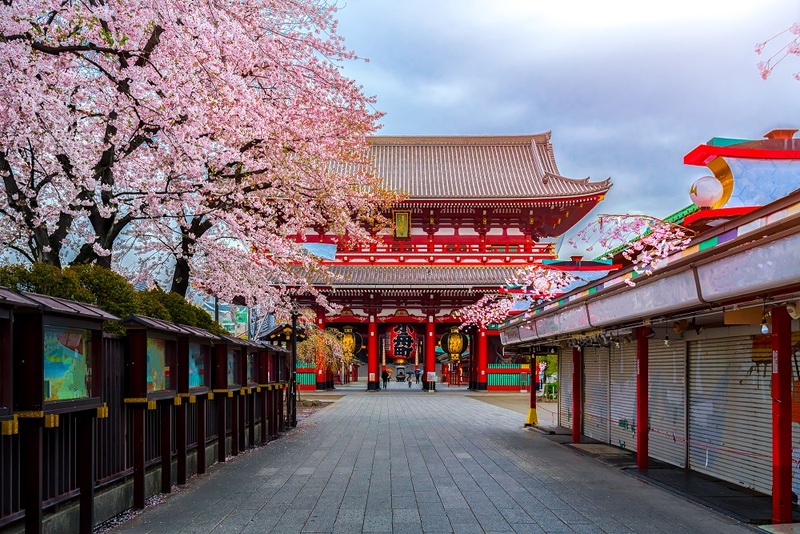 A manufacturing, shipping and entertainment hub in Aichi Prefecture, Nagoya is also known for the delightful hues it takes on during the cherry blossom festival in Japan. The Yamazakigawa Riverside is one of the best places for cherry blossom viewing. 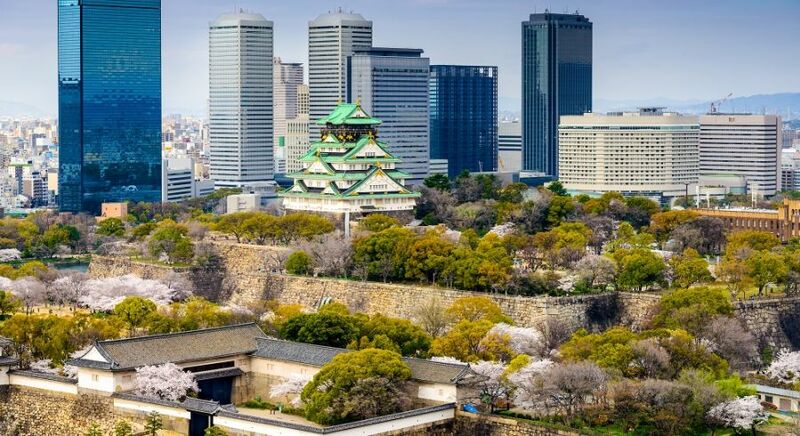 While in Nagoya, you could consider staying at Hotel Nagoya Castle or Hotel Amanemu. 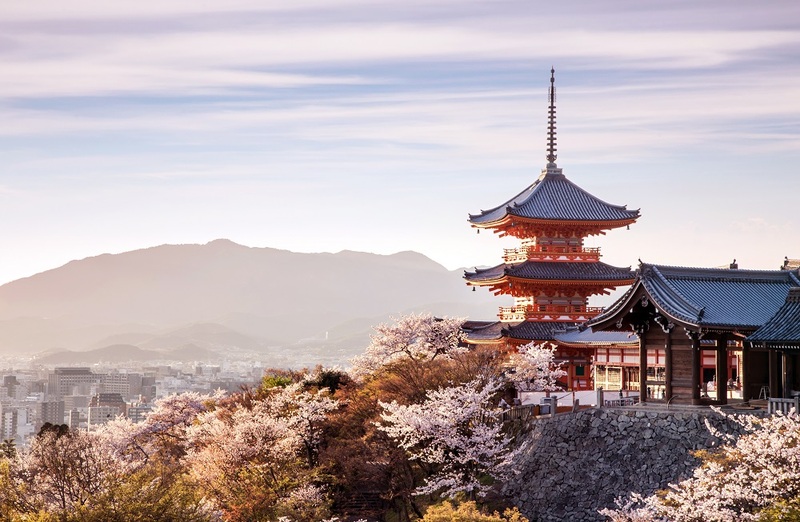 With its 17 UNESCO World Heritage sites, shrines, tea rooms and ryokans, Kyoto offers plenty of options if you’re on a cherry blossom tour. The best known of these include the Philosopher’s Path, Maruyama Park and Arashiyama district. While in Kyoto, you could stay at Gion Yoshi-Ima, a traditional lodge with minimalist rooms, tatami flooring and futon beds. 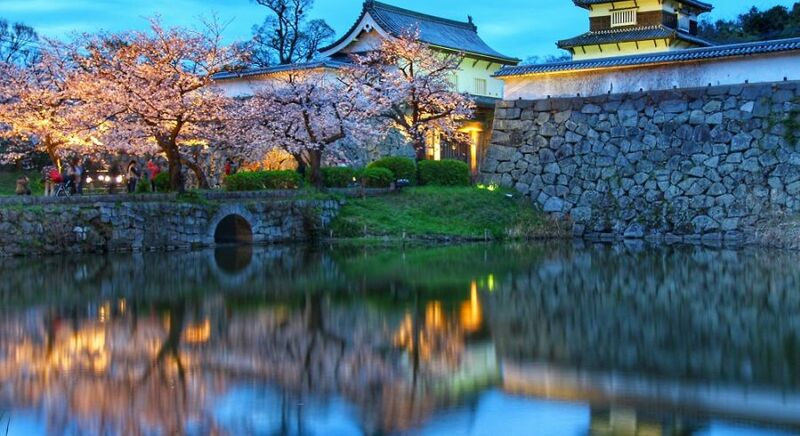 Alternatively you could stay at the Ritz-Carlton Kyoto that is set on the banks of Kamogawa river providing fabulous views of the Higashiyama mountains. 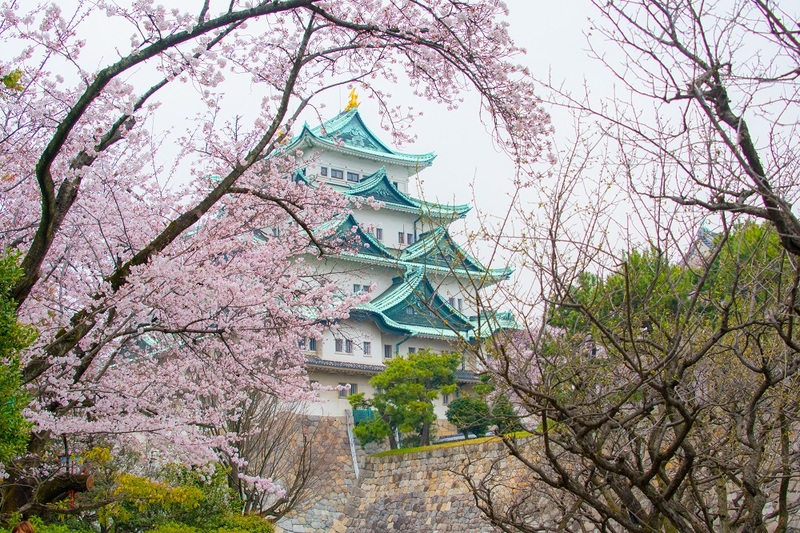 A city known for its gourmet street food and the Osaka Castle among other things, this is a fantastic destination for cherry blossom viewing. Among the favored hanami spots here is the Kama Sakuranomiya Park, with its vast lawn for picnics and cherry trees set along the Okawa Riverside. 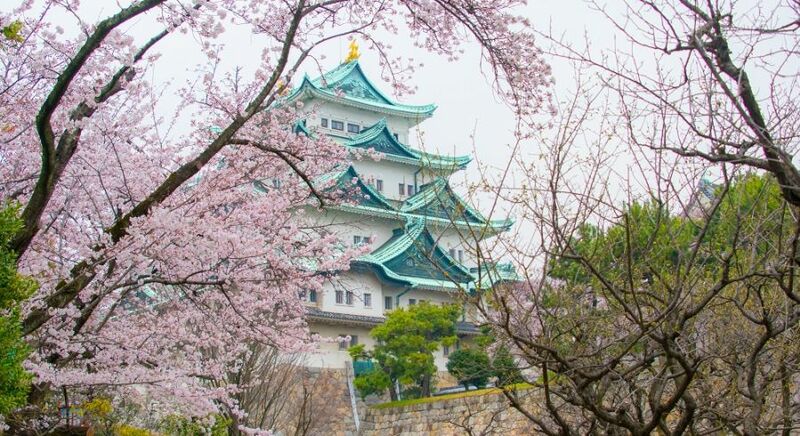 The other great hanami spot is of course Osaka Castle. While in Osaka, stay at Hotel Granvia Osaka that offers luxury accommodation with bright, airy rooms and specialty restaurants. Or you could stay at St Regis Osaka, another luxurious hotel situated near Osaka Castle and Universal Studios Japan. A harbor city on Kyushu island possessing a cosmopolitan vibe, Fukuoka is another great place to visit during the cherry blossom festival in Japan. The best hanami spot here is Maizuru Park in the premises of Fukuoka Castle. While it is known for hanami parties, there is also an observation deck in the main citadel of the castle that makes for a great vantage point to view cherry blossoms. While in Fukuoka, stay at Nikko Fukuoka which offers easy access to train stations as well as the international airport. Alternatively, you could stay at Grand Hyatt Fukuoka. 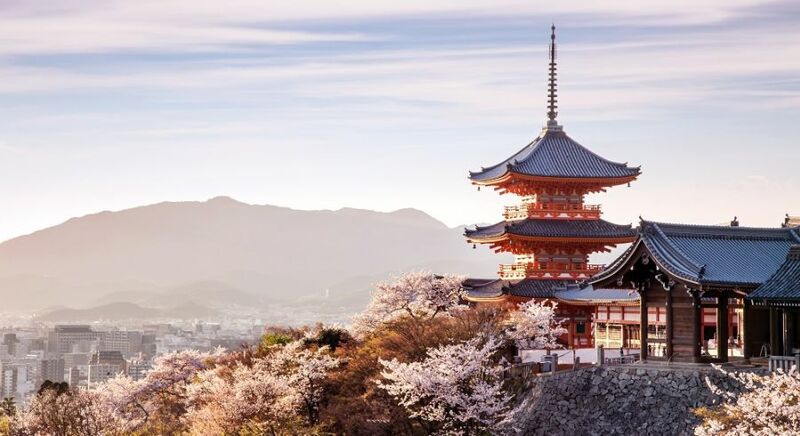 Experience the best of the cherry blossom festival in Japan with a completely tailor-made private tour. Get in touch with us for your obligation-free itinerary.